Hill House forms the major part of a complex regeneration site in Archway, Islington and includes the 1970s office building (Hill House), the Archway Mall and open spaces adjacent to Highgate Hill and Junction Road. The Hill House site was identified in the Islington Local Plan as the key site in the future regeneration of the area which is a long-standing aspiration of the Council and local community. CMA have been leading a multi-disciplinary design team to bring forward an innovative town-centre development. The conversion of Hill House under permitted development (PD) rights to create 150 units forms a central part of the project. 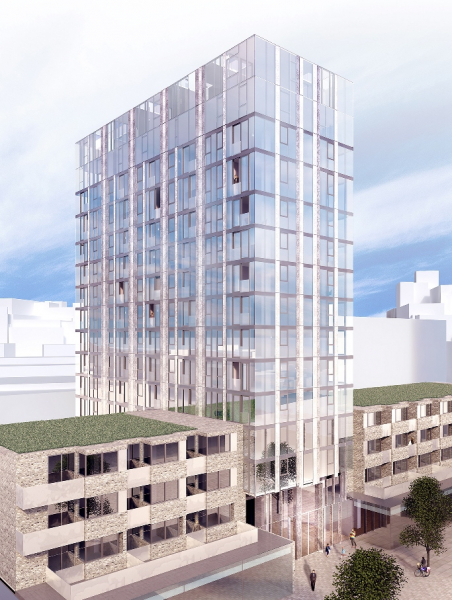 Despite the political controversy surrounding PD, CMA then secured consent from Islington Council for a two storey extension to the existing building to create a further nine additional flats. CMA have secured a wide range of other approvals to enable the development to come forward. The first phase of development includes a new town square and refurbished retail space, whilst future phases of development including retail, residential and office space are being developed in consultation with the Council and other key stakeholders.